I am showing you two different ways to do this card. I wish they looked as good online as they do in real life as it is hard to see how pretty it is via the picture. The 2nd picture gives you an idea of the beautiful shimmer the embossed Shimmer Sheets has, but I just couldn't capture it on the first picture. 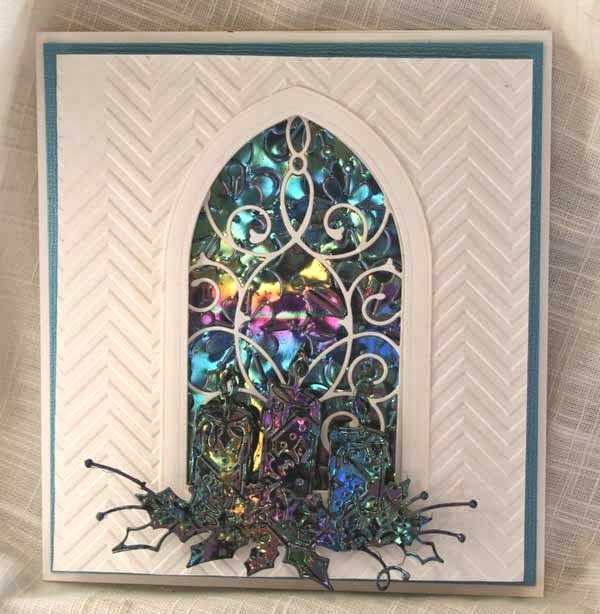 A Shimmer sheet by Elizabeth Craft was embossed with the Flowered Lattice, giving it a stain glass effect for the window. 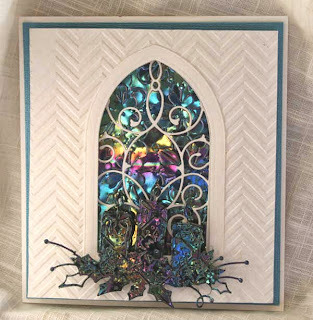 Then the Grand Gothic Iron Work Window was cut and attached to the Shimmer Sheet using Glue and Seal. 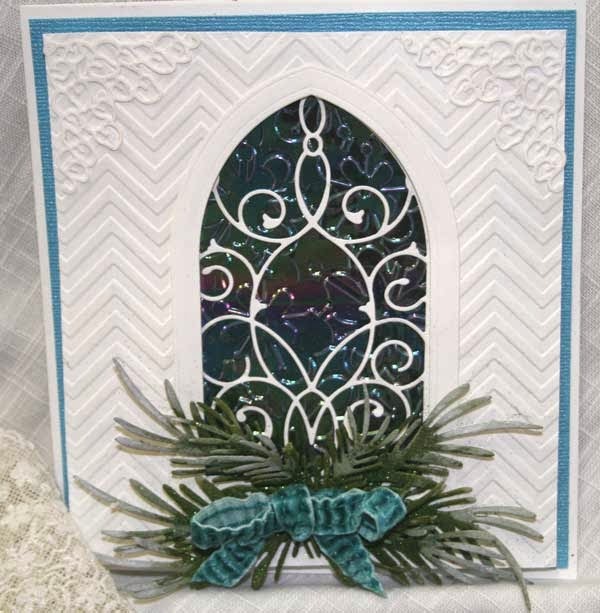 A piece of white card stock was embossed with Crafters Companion 6x6 Chevron Embossing Folder and placed over the window. On top of that the Grand Gothic Window was placed to frame and finish off the window. Please click on picture for a better view. Magnolia's Sprawling Fern was used on the above card. I just love this die as I believe it is the most natural looking pine die I have seen. I added some green glitter to the pine branches and then once dried, White Picket Fence was added on top. Cheery Lynn's Corners were attached to the corners. This was not my favorite ribbon to use, but the only one I had that matched the colors. Guess I need to order some. The Glowing Candle die cut more of the embossed shimmer sheet and then popped up under the window. It is very, very hard to see, but so gorgeous in real life. Products used on this card can all be ordered from Joan's Gardens. Oh Joan these are STUNNING!! WOW! what beautiful creations. I'll need to add this to my list of purchases ... my Mom will certainly want some cards made like this for her church friends. B-E-A-U-T-I-F-U-L!! Both are so beautiful. Love the effect and the shimmer sheets really are great. Edna B. Exceptional card. It's fantastic and I love it. Joan, Love your cards, have to try this, as I have all products you used!! Will send you a private email on all else, again WONDERFUYL cards, so very pretty!! Beautiful work, Joan. I love that paper behind the window, it have great colors!!! This paper is stunning. Beautiful work with the card as well. Plus, I love my pine branch that I received from you this week.